Are you looking for non-stop Trop Rock Music to enjoy on your computer? 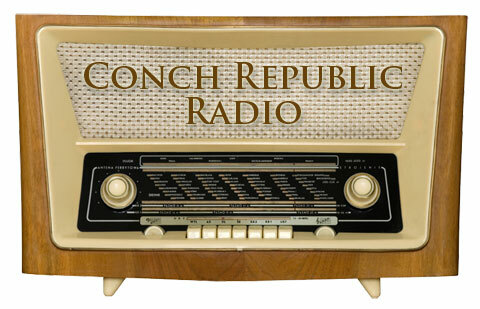 Conch Republic Radio streams tropical music 24 hours a day 7 days a week, free and on demand! With the help of ConchRepublicRadio.com, created by The Conch Republic Media Group, Key West, FL you can transform your computer into a tropical Trop Rock jukebox! Take a virtual island vacation right from home! Conch Republic Radio delivers your favorite island tunes in multiple ways. Conch Republic Radio is feel good music from the islands. Less talk, more squawk, non-stop Trop Rock music! Listeners are invited to request new Trop Rock musicians and Conch Republic Radio will be sure to feature them into our play list. Conch Republic Radio combines the love of the ocean with Trop Rock music and delivers a mix of entertaining videos segments featuring island themed musicians and their CD cuts. All streaming from our Key West, Florida radio station! Conch Republic Radio offers a broad mix of artists such as Howard Livingston and the Mile Marker 24 Band, Scott Kirby, Paul Cotton from Poco, Hugo Duarte, Michael McCloud and scores more! Conch Republic Radio also plays a wide range of Trop Rock musicians you have yet to hear. Every musician’s website is provided so be sure to write to them and let them know that you heard their songs on Conch Republic Radio. While you’re there, you can order their CDs. You’ll be helping them directly by supporting their creativity and you’ll feel great because you did. Thank You! NEW!!! We are now approved by ASCAP, BMI and SESAC to play all their artists! This is exciting news because we will be bringing you a complete line up of “popular” Trop Rock musicians in addition to all the talented independent artists! New musicians are being added daily so log on often to Conch Republic Radio!